Judge Vincent C. Crawford, a Savannah native, graduated with honors from FloridaA&MUniversity in 1987 with a Bachelor of Science degree in Political Science. He received his law degree from MercerUniversity in 1990 and graduated from law school with honors in the area of trail advocacy. Judge Crawford began his legal career with Georgia Legal Services in the fall of 1990 and with a primary practice of representing battered women in divorce proceedings. In 1993, he began his career as a prosecutor with the Richmond County District Attorney’s Office and as a Deputy Chief of the violent crimes division. He joined the DeKalb County District Attorney’s office in April of 1995 and served on the DeKalb County District Attorney’s office trial team for 2 years. In April, 1997, Judge Crawford began his solo practitioner career in the areas of domestic, juvenile, and criminal law. On February 27, 2005, he was appointed to the position of Associate Magistrate Judge for DeKalbCounty. Judge Crawford was sworn in as an Associate Juvenile Court Judge for the DeKalb Juvenile Court on March 24, 2006. Judge Crawford is a member of the Georgia Council of Juvenile Court Judges and the National Council of Family and Juvenile Court Judges. 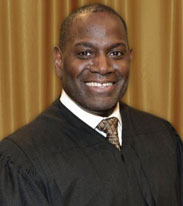 In 2009, Judge Crawford received the Georgia Department of Human Resources & Youth Empowerment Award in addition to his receiving the Romae T. Powell Award from the Juvenile Court Association of Georgia for his outstanding contribution and dedicated services to the field of Juvenile Justice. On March 31, 2012, Judge Crawford received the Recognition of Outstanding Leadership Award from Jack and Jill of America, Inc. He is a member of Alpha Phi Alpha Fraternity, Inc. In 2011, he was appointed Chairman by the Supreme Court of Georgia for the Juvenile Court Improvement Initiative.